Jorginho is reportedly having a medical ahead of finalising a £57million transfer to Chelsea from Napoli, according to the London Evening Standard. While this will be greeted as good news by many Blues fans, there may also be cause for concern as it may result in the departure of one of their most important players. That’s according to Gianluca Di Marzio, who reports that the Jorginho transfer could pave the way for N’Golo Kante to move to Barcelona after becoming a target for the Catalan giants. 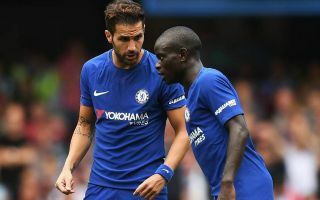 Barcelona certainly look in dire need of new signings in midfield after losing both Andres Iniesta and Paulinho in the same summer, and Kante is one of the best in the world in that position. The France international has a World Cup final to think about first, but could be a superb signing for Barca to help them get back to their best after a few years of under-achieving in the Champions League while rivals Real Madrid have won the last three in a row. Di Marzio adds that Barcelona could also try offering Andre Gomes to Chelsea as part of the Kante deal, though the Portugal international’s recent form suggests he’d be far from an ideal replacement.